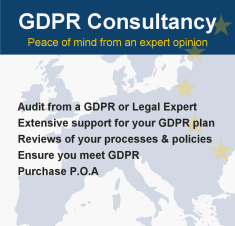 The GDPR, or General Data Privacy Regulation, comes into effect as of May 2018 and requires your organisation to create and maintain a plan to protect personal data that you collect, store and use, detail what to do in the event of a data breach, regularly evaluate your security practices, and document evidence of your compliance. Who does GDPR apply to? Does GDPR apply to me? The new GDPR regulations apply to all companies worldwide that process personal data of EU citizens. You don't have to be based in the EU for this to apply, and Brexit isn't likely to have an impact. If the UK wants to continue to trade with the EU, the UK Data Protection laws are likely to mirror GDPR post-Brexit. Past and present employee data or contractors, suppliers, consumers and customers. Websites and apps that track digital activities by storing IP Addresses and/or cookies. Ecommerce websites that store customer details. Small business with fewer than 250 employees are not exempt if: “the processing it carries out is likely to result in a risk to the rights and freedoms of data subjects, the processing is not occasional, or the processing includes special categories of data […] or personal data relating to criminal convictions and offenses”. How can GDPR Software help? Our GDPR software platform is a comprehensive system that aims to simplify the process of the GDPR journey. Our GDPR compliance online tool provides you with a question and answer framework, supporting documentation, and audit trail of evidence for you to be able to demonstrate your organisation is operating within GDPR guidelines. 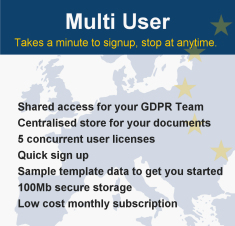 Designed for any company size from one person working from a home office, up to large corporations that may have an allocated GDPR team. 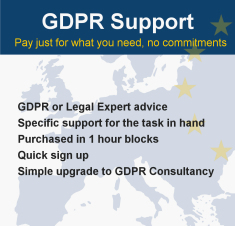 If you need to be GDPR compliant quickly and easily this system is for you! 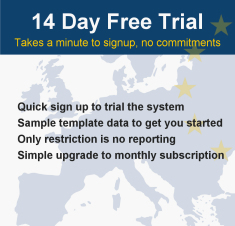 With a variety of packages available to suit your GDPR needs, try our 14-day FREE trial now to see how quickly and easily you can kick-start your GDPR roadmap. 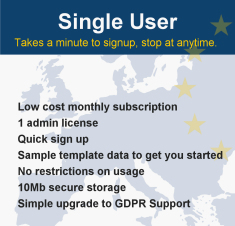 Email sales@gdpr-software.com Available 9:00 to 17:00 GMT Monday to Friday. Copyright © 2010 - 2019 Impact Technology UK Ltd T/A GDPR Software.